Hi guys! Hope you are enjoying the summer holidays as much as I do? While I am currently in Budapest together with three good friends of mine, today I would like to share with you the first outfit from our trip to Italy last week. Because city trips are often intensive because of the immense walking my boyfriend and I normally do during the day it is really important to have a proper and comfortable bag with - like the one from Herschel (get it here) you can see above. Besides the fact that its a stylish backpack (which is quite a rare thing if you ask me) a lot of stuff fits in, which is really nice. What do you think about it? And what kind of bag do you prefer wearing when city hopping? Happy Sunday! Love this casual look! Beautiful pictures! 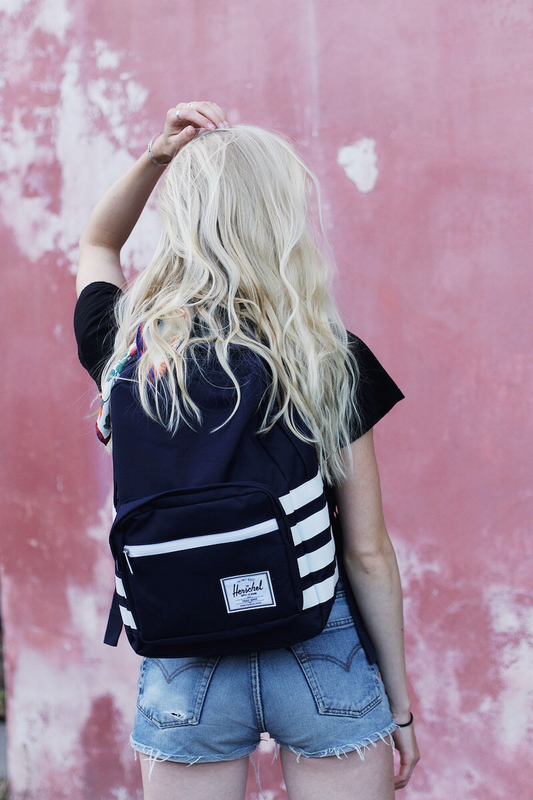 i'm super in love with herschel as well!